Boas-Red Tail - BCC vs BCI. Can anyone explain? BCC vs BCI. Can anyone explain? Hello everyone longtime RZer first time boa poster lol. J am usually over in the iguana forum. Anyway I am finding myself quite confused by this whole BCC BCI thing. Can someone please explain to a blonde girl in the simplest way possible or better yet, just tell me what my girl is lol. I could care less whether she is "true" or "common" because I will love her either way. But out of curiosity I must know what she is. I hate not knowing things about my pets so this is driving me nuts! We got her from the Steel City reptile show and were told she was a pastel red tail about 7 years old. But after looking at pics online I’m not so sure. Anyone have a guess what out big baby is? I don’t have a pic of her tail but ican get one I needed. To me it looks like a normal red tail... Um tail lol. Here she is with my fiancé. Very beautiful girl you have there! She’s definitely a bci. Just google bcc and bci and read up on it. There are also older post about the same topic if you just scroll down the threads. I went through the same phase as you are now...i read for days and I know the difference but could never explain it ...I just know a BCI is a cross breed and easier to keep than a BCC ...true red tails from Guyana and Suriname are fussy , have regurging issues as a worst case scenario and possibly more attitude than a more inbred BCI. Now what I am saying is not gospel and just like people everyone is different and some BCC are excellent snakes...but they do have moire issues associated with them, whereas the BCI is much more , how can I say, domesticated??? There are so many morphs out there who knows where the real genes are anymore. The Regurgitation Syndrome is one of the most frequent causes of death in true redtail Boa constrictors!!! It is associated with a significant loss of water and minerals in the affected animal’s body. Mostly the snake keeper is responsible for the occurance of the Regurgitation syndrome due to wrong feeding! Now, i have a Suriname and a Peruvian red tail and have NEVER had any of these issues. Try to stay away from wild caught snakes if possible. Wild caught snaked tend to have more issues than captive bred snakes do. Umm BCI are not cross breeds Chris hon. Though cross breeds generally are lumped under BCI classification. I still have lots to learn about the various boa species too. Its ok CP. Me too! Its the age old...the more ya know...the more you know you dont know! Hi, I’ll just say you’re blessed to have a bci. I think they’ve been bred in captivity longer, so my theory is they’re becoming tamer. I have two females that are bcis and they’re really sweet, but I also have a male bcc that’s really fussy and squirmy. And, just out of curiosity, did you get her from the guy that sells the mice? I usually go there and pittsburgh every show. Mine are also BCI. I love my big lugs. 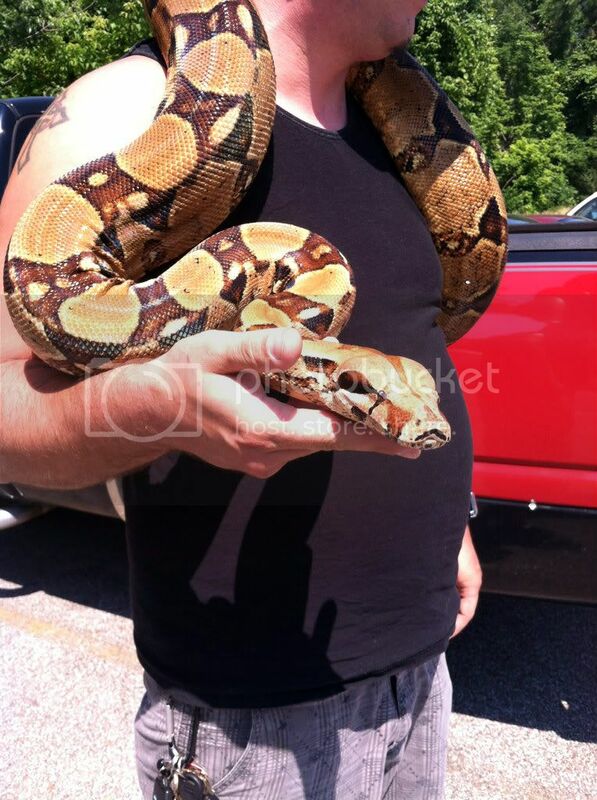 Boas, no matter what their locality or morph...are beautiful animals in my book.